Even mentioning the words “Christian movie” stirs polarizing opinions in people. For some, the term is synonymous with overly-preachy, low-budget films. For others, the sentiment offers the notion that the film will contain a certain ideology (for better or worse). Therein lies this film’s greatest strength. Rather than be overbearing with its message, the film allows for the viewer to make up his or her own mind as to the overall point. It does not attempt to preach, but instead offers a light-hearted comedic look behind the curtain of ministry. 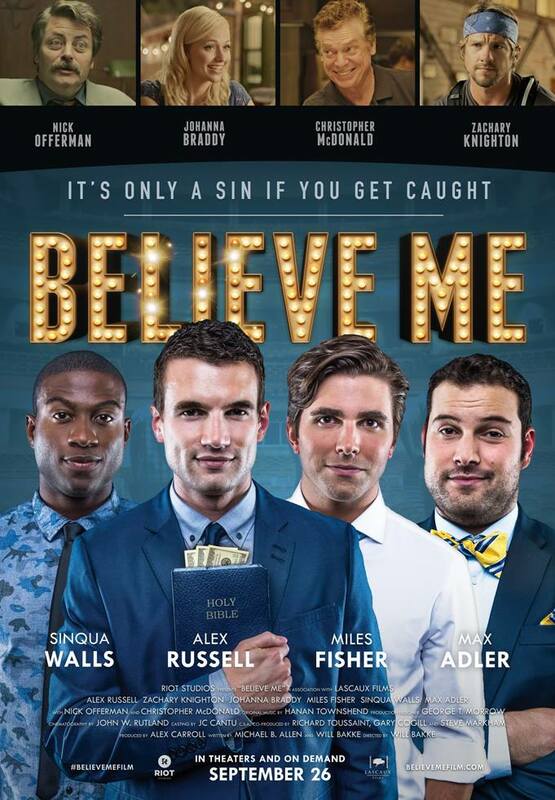 Believe Me stars Sam (Alex Russell) as a fast-talking, self-absorbed college senior, anxious to graduate. 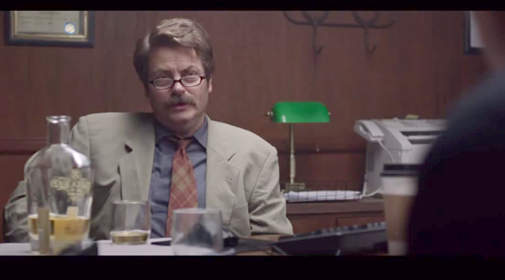 He is told by a drunk college counselor (a small cameo hilariously played by Nick Offerman) that his scholarship has expired and he now has three weeks to come up with the rest of his tuition. Worrying about where he will get the money, Sam has an epiphany during a church event. 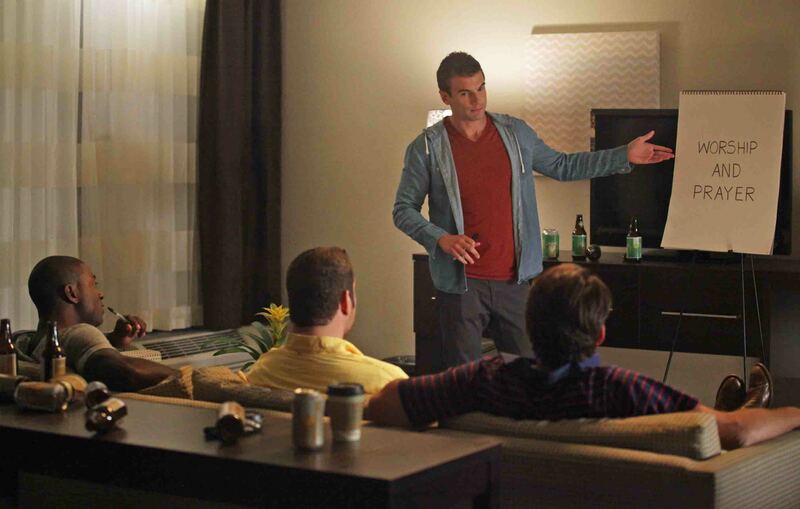 Realizing that he could easily rake in the money through a fake charity, Sam convinces his friends Baker (Max Adler), Tyler (Sinqua Walls), and Pierce (Miles Fisher) to help him set up “Get Wells Soon”. Their attempts to fundraise for this fake charity quickly catch the attention of a national organization, headed by Ken (Christopher “Shooter” McDonald), who offers them a chance to go on tour with the well-funded group to raise the money. Sam and friends join the group and skim a little money off the top each night for their own gain. As the tour continues and the risk increases, their consciences begin to set in. Sam is left with the decision to continue the charade or abandon his fraud. This film is written and directed by Will Bakke (with co-writer Michael B Allen). They are the same people that created the documentarys Beware of God and One Nation Under God. In this film they poke fun at various Christian stereotypes. From the vague and generic sermons, to the self-absorbed worship leader who only knows one song, this film covers a lot of topics. There’s a particularly hilarious bit in the film on the subject of how to pray and what to do with your hands. Yet, despite the film’s clear Christian ideology, it never once feels forced, preachy, or mean. Instead, it offers the viewers a chance to separate themselves and watch as the characters slowly learn there is more substance and truth to that which they are mocking. While watching this film, one can’t help but notice similarities to films like Leap of Faith, the heart-warming dramedy with Steve Martin. Like that film, Believe Me centers on a con man attempting to use the generous nature of religious people to swindle them out of their hard-earned money. And like that film, the con begins to unravel as the severity of the crime weighs down upon their collective conscience. In Leap of Faith, Steve Martin plays the fast-talking con man, able to see a world different from all the other characters. Believe Me takes this one step further. The four college friends all seem to have a devil-may-care attitude and confidence about them that is equal parts Ferris Bueller and Tom Cruise. The chemistry the four friends share seems genuine to the point that one can’t help but be entertained by the friends, despite the despicable nature of their con. There is nothing overly unique about this film. It is enjoyable, but doesn’t carry the same substance that other films like Leap of Faith have. The conflicts that arise in Believe Me are somewhat realistic, but not surprising. Everything that happens in this film is formulaic to the point of being obvious. That said, it is not a poorly made film. The cast does a superb job keeping what could be a rather heavy subject light-hearted. The satire and even the serious content are all done with the care of a crew that knows the eggshells over which they walk. Where the film mostly falters is in the resolution of the film, which seems overly rushed. It is almost as if the filmmakers realized the severity of the corner they put their leads in and decided to just whip up something to attempt to wrap everything up nicely. Only, it left more questions than answers in what was otherwise an enjoyable film. If you are looking for a fun, satirical glimpse into the world of ministry, you could do far worse than this pleasant film. However, if you are looking to add substance and depth, you won’t find it here. This entry was posted on Friday, September 12th, 2014 at 9:28 am	and is filed under Film, News. You can follow any responses to this entry through the RSS 2.0 feed. You can skip to the end and leave a response. Pinging is currently not allowed. « Film Review: ‘A Five Star Life’! !